Jason has joined the Bass Bum ranks sending in these pictures. He commented that "I live a 3 minute longboard ride away from a lake and I catch fish out of there like no other." 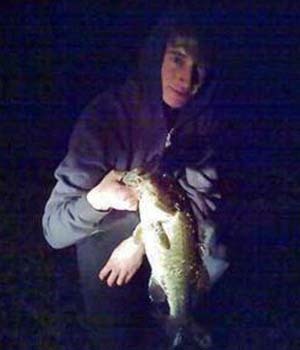 Bass lake fishing in small lakes and ponds. Sometimes it doesn't get any better than that. 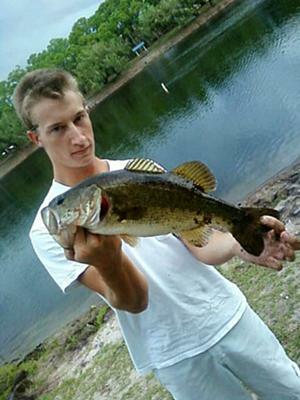 And there are an abundance of small Florida bass fishing lakes, one of which it seems Jason has tapped into. 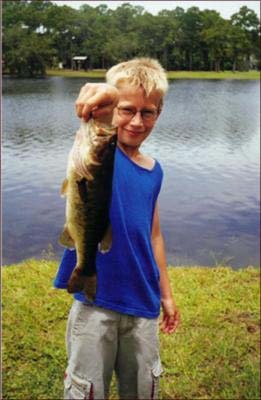 We like seeing someone who started young and has kept the desire for bass fishing. The sport needs a steady flow of new, passionate bass fishermen to replenish the sport and preserve it for years to come. Oh, and by the way, I'm an old guy and am not sure what a "longboard" is. Can anybody help me out with that? Hey Jason nice fish but you should really not hold them vertically it can injure the fish to hold them unsupported like that. Hold them horizontally with a hand under the belly to support the bass. Anyhow keep "catchin em" and..... Tight Lines! Hey Jason, those are some cool Florida pond largemouth bass. Way to go! What do you think is the biggest bass that you've pulled out of there? @Burns: I believe a longboard is a type a skateboard. I always see a couple kids who ride them back and forth to the school my kids go to. If you do a Google Image search for "longboard" you'll be able to see quite a few different varieties available on the market.